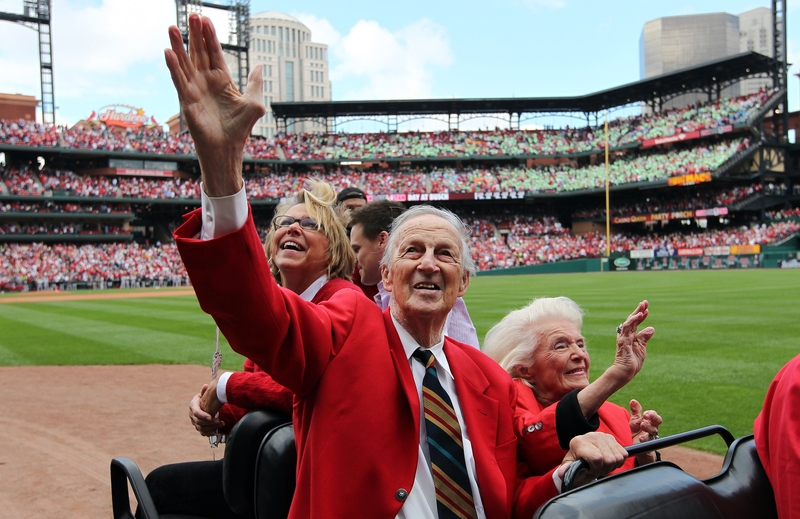 Cardinals nations is mourning the death of Cardinals Hall of Famer Stan Musial at the age of 92. Musial, who played his entire 22-year major league career (1941-63) for the Cardinals, died Saturday evening at his home in Ladue surrounded by his family. Musial was the first player in Cardinals history to have his uniform number retired, and he was a first-ballot Hall of Fame selection in 1969, being named on 93 percent of the ballots. A three-time National League MVP (1943, 1946 and 1948) and winner of seven NL batting titles, Musial played in 24 All-Star Games (from 1959-62, Major League Baseball held two All-Star Games each season) and finished his career with a .331 batting average. At the time of his retirement, Musial stood as the National League’s all-time career record holder in games (3,026), runs scored (1,949), hits (3,630), doubles (725) and runs batted in (1,951) among other records, and he was still ranked among the top 10 in those categories in 2012. Musial, who was born in Donora, Pennsylvania, signed with the Cardinals in 1938 and made his major league debut with the team in 1941. Musial was a member of the Cardinals teams that won the World Series in 1942, 1944 and 1946. He missed the entire 1945 season to serve in the United States Navy during World War II. Musial was named a Cardinals’ vice president at the end of his playing career in 1963 and he served in that capacity for more than 25 years. In 1967, Stan served as the general manager of the Cardinals team that defeated the Boston Red Sox to win the World Series. 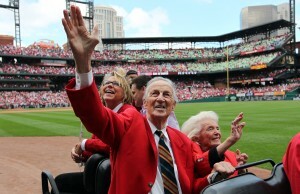 Musial’s wife of 71 years, the former Lillian “Lil” Labash, passed away in May 2012. The Cardinals have set up a memorial site around the Musial Statute at Gate 3 at Busch Stadium, which will remain in place until a date yet determined. The team has also set up a web page to pay tribute to Stan and allow fans to offer condolences to the family.